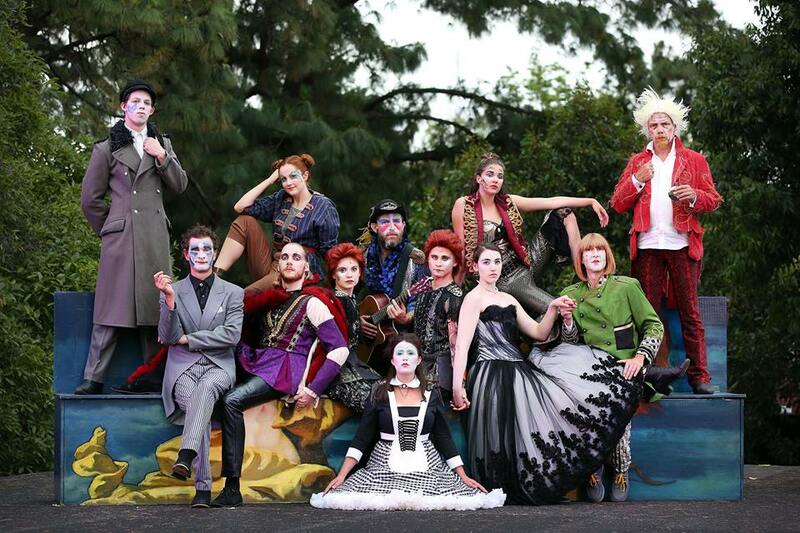 Shakespeare in the park. This seems to be one of those traditional events that has been around for quite a while, though I have to admit that this is only the second that I have seen. Ironically, the previous one, which was in Adelaide years ago, also happened to be Twelfth Night (or so I believe, though it was so long ago I sort of can't actually remember which play it was that we saw, but I am sure it was Twelfth Night). Anyway, one of the reasons that I didn't go the last couple of years was because it was a performance of Romeo and Juliet and I have to admit that I am not a big fan of that particular play, though one of the reasons happened to be a Baz Luhrman production of which Leonardo Di Caprio was the star (though the other reason is that it is basically overrated). However this year it happened to be Twelfth Night, and it is one of those plays that I don't really mind all that much, or not all that much until I realised how soppy the play happens to be (in my Goodreads review I gave the play a five star rating, which is the highest). A number of years ago a version was released in the cinemas starring Helena Bonham Carter as Olivia and Ben Kingsley as Fester, and that version was actually quite well done. I even stumbled across it on Youtube, though it has since been taken down, namely because it was no doubt a huge breach of copyright. However, it does appear that the BBC version is up, so I'll embed that one instead. However, after seeing a really, really bad version of it where the director divided the show into a romantic comedy and a farcical comedy, and you could watch one or the other (but not both), I realised that this actually isn't one of my favourite plays. Okay, I will put it down to a pretty bad performance that was quite amateurish, however when I went and saw it again, this time in the park, it did strike me that the play actually isn't as good as some of Shakespeare's other plays. In fact, if there is a description that I could give this play, it is a 'soppy romance'. As I was sitting there among the crowds I sort of wandered what it was with the whole thing about Shakespeare being performed in the park. It isn't as if this was something that came about from his time since most performances were held during the day. Well, okay, if you happened to live in a small village then no doubt the performances would have been held in the town square, but back in those days you would have traveling players, like the ones we meet in Hamlet, who go from town to town and village to village performing for the locals. Mind you, unlike today, this wasn't a glamorous profession, but then again most actors crash and burn and it is only a handful that actually make it big - it is just that everybody wants to be a part of that handful. However there is a thing about some of Shakespeare's plays that make then quite suitable for an outdoor setting - they are what could be considered pastoral comedies, of which three stand out the most: The Tempest (set on an island), Midsummer Nights Dream and As You Like It (which are both set in forests). The thing with these plays is that a bulk of the action is set in the wilderness, or not so much the wilderness but rather an outdoor setting in what could be considered an idyllic world. In fact, in As You Like It, the Forest of Arden has such power over people that wander inside that they will actually be transformed from being a villain to being a pious monk. 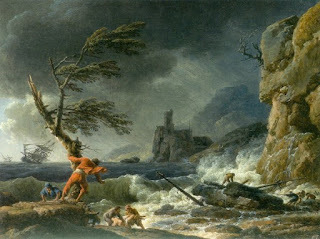 However not all of his plays have such a setting, and the tragedies such as The Scottish Play, Hamlet, and Romeo and Juliet certainly aren't pastoral in their outlook. Sure, a bulk of King Lear is set on the moors, but the moors are a barren and horrifying place that drains the sanity from those who wander inside, and once again is not so much a garden, but a desert. However, Twelfth Night is a bit of an enigma. In a way it is a pastoral comedy, and in a way it is not. In my mind most of the action happens indoors, mostly in Oliva's manor, as opposed to in the outdoors. However, it is set in a mysterious land, a land that doesn't actually exist (Illyria), though I would put it somewhere on the Balkan coast of the Adriatic. It is probably time for me to actually give a rundown on the plot. As I have mentioned, the play is set in the fictional land of Illyria, and where the duke Orsino is smitten with the Lady Olivia, who doesn't return the love. This is causing problems for the land because the duke is too love sick to be able to actually do anything. As for Olivia, she is still mourning the death of her brother, and also has her uncle, Sir Toby Belch, living with her in her manorhouse. Into this world comes Viola, a young lady who managed to survive a shipwreck, but believes that her twin brother, Sebastian, didn't. Being on her own she decides to masquarade as a boy and seeks employment with the duke Orsino. Orsino then decides to make Viola his messenger and to pass notes on to Olivia in an attempt to woo her. However Olivia falls in love with whom she believes is Cesario, while Viola falls in love with Orsino. This creates some very clever sexual tension since neither Olivia nor Orsino are aware of Viola's true gender, and Viola needs to refrain from doing anything that would cause Orsino problems, while fending off Olivia's moves. Meanwhile, down in the kitchens of Oliva's house, we have Sir Toby Belch, Andrew Aguecheek, and the maids, who are basically up to no good. They are loud, rauchous, and Belch is a raving alcoholic. In fact this particular play really played up Belches' alcoholism by having him drag a keg full of beer around and also carrying a whiskey flask that was huge. 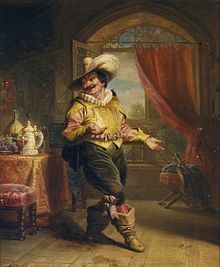 With them is also the jester Feste, who provides the musical score for the entire play. So, after making huge amounts of noise they bring Malvolio, a puritanical servant of Olivia's (who happens to be in love with her, as is seen with his first encounter with Cesario/Viola), into the kitchen to chastise them for making so much noise. In response the rowdy occupants of Olivia's house forge a love letter and have Malvolio find it, who then goes and makes a fool out of himself in front of Olivia, and is dragged off into the cells to be 'cured'. Then enters Sebastian, Viola's twin brother, and suddenly the games of mistaken identity begin as Olivia believes Sebastian to be Viola (or rather Cesario), and Sebastian basically decides not to question the fact that a strange, yet beautiful and wealthy woman, decides to declare her undying love for him and drags him off to be married, and decides to simply go with the flow. In the end, as can be expected of such a play, everybody ends up getting married, with the exception of Malvolio, who slinks off in dejection. The thing that does stand out here is that there does seem to be two plays running side by side. This isn't the typical Shakesperian side plots and complicated stories that all become interwoven at the end, this is actually two plays that could easily be separated and performed alone - in fact this was done quite recently, even though it was, in my opinion, done quite badly. This is probably not surprising since Shakespeare is well known for borrowing his stories and plots from elsewhere and then building upon the original concept to come to the plays that we know today. However, what we have here are two vastly different comedies - one slapstick, and in fact pretty farcical, and the other a romantic comedy that has lots and lots of sexual tension. However, the problem that I faced was that I never particularly liked either of them. Sure, the tension that comes out of the fact that nobody actually knows Viola's gender is very clever, but that is the nature of the romantic comedy. Well, okay, it isn't, especially when you compare a Shakesperian romance with a modern Hollywood Romance such as, say, Pretty Woman (to pick a random movie). In many cases the modern romance is all about the act of a couple courting, and the comedy (if there is any) generally comes out through the situations that they find themselves in. 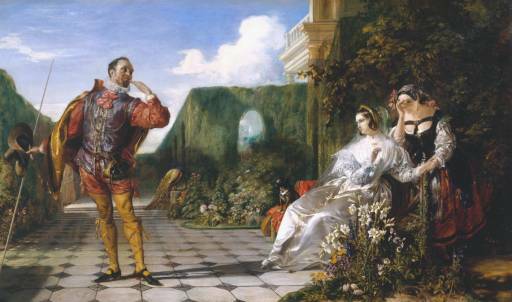 However, in Shakespeare, this isn't necessarily the case - Orsino is in love with Olivia but Orsino isn't going to finish the play being married to Oliva. Rather it seems to be more of a love triangle, or an even greater mismash with Malvolio is thrown into the mix. Yet the other play is basically about a group of people acting like idiots. In most productions they will be really hamming this part of the play up, namely because it is slapstick. In the production I saw they were certainly doing that, particularly with regards to Sir Toby's alcoholism. 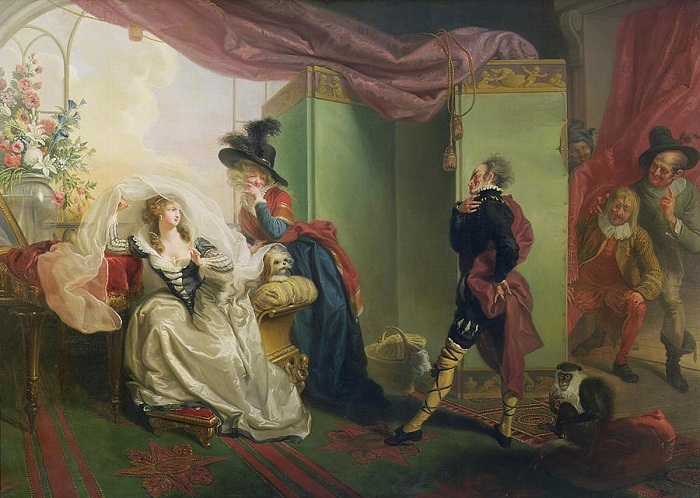 However, the interesting thing in the play is that the main characters seem to get away with being jerks, and Sir Toby even ends up getting married despite some of the cruel jokes that he had played on other characters. Which leads me to the treatment of Malvolio, which I have to admit gets a really sharp stab in the play. Sure, nobody likes a party pooper, but we sort of wonder why it is that people label him as being 'self-righteous'. The reality is that he is only doing his job, and if his mistress awakes due to a disturbance in the kitchen then he is going to be the one who gets in trouble. However, more subtley, is that he does have affections for Olivia, but this isn't surprising - he is her servant, and being her servant he will do anything and everything for her. This is why, when the note is discovered, he immediately responds the way he does - he has been serving her for years, and as he does so his love for her builds to a point where when it appears that it is to be returned, he takes it without asking any questions. In fact he is so smittern with her that he interprets an obviously fake letter as being the real deal. 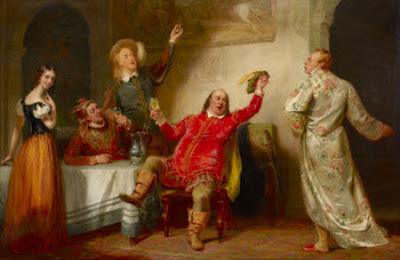 Yet for a noble and loyal servant, he is certainly treated pretty badly, but I suspect that this has something to do with the nature of the play - it is slapstick and farcical, and Malvolio is the foil. The problem is that at the end, when he shows Olivia the latter and she laughs, pointing out that it is an obvious forgery, and dismissing it out of hand without any way of apology to Malvolio, it seems that he is being treated unfairly. In a way it is knocking him off his perch - how on earth could the lady have such affections for a servant - he is a servant and servants aren't worthy of such affections from their masters (or mistresses as the case may be). It is still rather uncomfortable though because it seems that both Belch and Aguecheek get away with, well, basically being jerks, which is really disappointing. In fact Belch even ends up getting married with one of the conspirators. In one sense, maybe it is that Malvolio has that sense of self importance, and stepping out and declaring his love for Olivia is stepping over the boundaries that has been set by society. Maybe it is that he needs his bubble burst, and that he is too zealous in acting as Olivia's gatekeeper, which is why in the end he slinks off, a broken man. Honestly, he is a rather annoying character, yet a part of me felt that he was treated rather unfairly, and seeing him slink off at the end does leave the play somewhat lacking. I'm rather a fan of Twelfth Night myself, but enjoyment definitely hinges on the quality of the performance. The choices made by the actors can totally change the meaning of the play - particularly the Malvolio subplot. The first time I saw it, Malvolio was played kind of pathetically by an older man, and I truly felt sorry for him. In the next, Malvolio was portrayed as clearly scheming for Olivia's fortune and body, rather than interested in her personally. It's amazing what a little body language can do with this. The most recent time was the best, with one of my favorite local actors cast as Malvolio. He was wound so tight, and clearly took inordinate delight in being a prig and looking down on the other servants that you really felt he did deserve what he got. 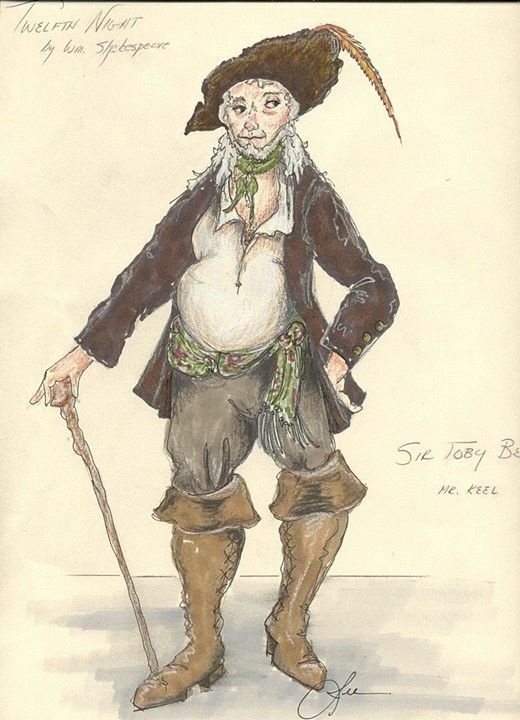 On a related note, the portrayal of Sir Toby also changes things. Toby does in fact get punished - by the embarrassment of marrying a mere servant. (He is nobility, if not exactly noble.) If Maria is portrayed as being a bit more than even Toby can handle, so much the better. But let concealment, like a worm i' the bud, Feed on her damask cheek." can be a magical moment. My thoughts, anyway. I would still vote for Much Ado as the best comedy, but that is probably a matter of opinion. Thankyou for your comments. You always add that little bit extra to make me think about what I have written. 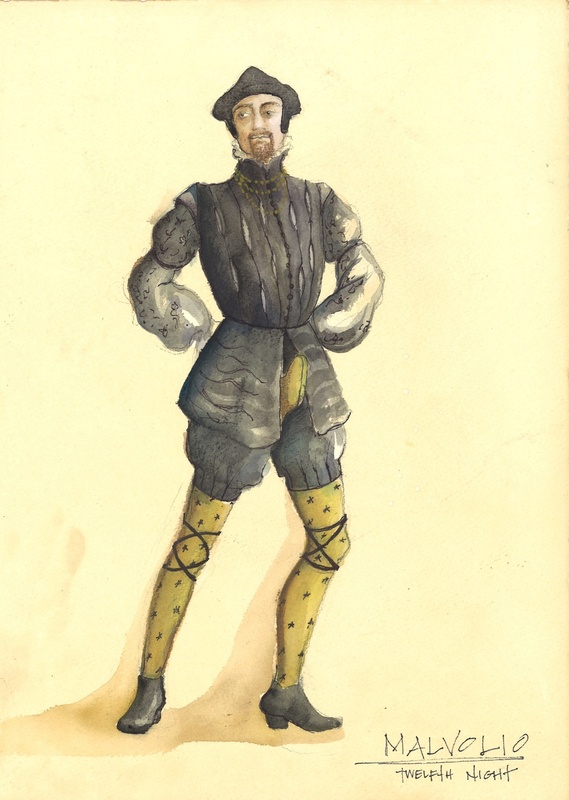 I agree that it has a lot to do with the way the play is performed, and I think I understand a little more about how Malvolio can be portrayed, especially by a highly skilled theatre troupe. And likewise. I love hearing your thoughts on all of these plays - I always learn something new and see something from a different angle.